The wall starts here in 15 meters (50 feet) with a sheer drop to 45 meters (150 feet). On the edge of the reef you find an abundance of basket sponges in all sizes, as well as sea fans and finger coral, to name a few of the coral types you see there. A healthy fish population includes black durgeons, parrot fish, rock beauties and schools of creole wrasse. 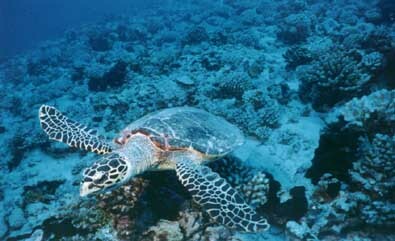 Sometimes even turtles and dolphins visit this very popular dive site. Depending on the weather a current may be present. The depth of the dive depends on the experience level of the divers.